The recordings that Jean-Pierre Rampal made in Prague in the second half of the 1950s contain some of his most spell-binding performances, questions of mono and stereo notwithstanding. He first visited the city in 1955 where he met Milan Munclinger, himself a flautist, who had recently founded the ensemble Ars Rediviva. Munclinger enabled Rampal to play at that year’s Prague Spring festival, and the following day the flautist and Alfred Holeček recorded Prokofiev’s Sonata Op.94. Maybe the pianist’s piano sound is shallower than that given to Robert Veyron-Lacroix when he and Rampal recorded the work in December 1956 for Erato but that hardly effaces Rampal’s superlative articulation and zestful characterisation, much less his sheer virtuosity. 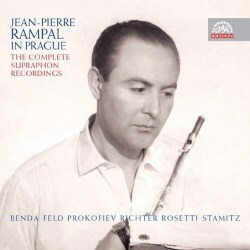 It was also through Munclinger that Rampal was introduced to Jindřich Feld, whose Concerto Rampal was to record in April 1958 with the Czech Philharmonic and Václav Jiráček, though he had broadcast it in 1956 and given its public premiere at the May 1957 Prague Spring Festival. Feld infiltrated a piano, harp and percussion into the accompanying string orchestra and the result is dynamic freshness redolent of a confluence of Prokofiev, Honegger and Martinů. Chamber delicacy ensures the music’s lyricism remains deliciously tart, never simple, and the slow movement is dramatic, even threnodic in places. The finale has contrasts a-plenty and an almost Stravinskian close. The Baroque was a formidable element in Rampal’s repertoire and these Prague recordings pay eloquent testament to his command of it. He plays František Benda’s Sonata in F with Viktorie Švihlíková whose sympathetic harpsichord accompaniment establishes a fine platform for his delightful warmth. That is no less true in the case of Franz Xaver Richter’s Sonata da camera No.3 with its affecting, dancing artfulness and deeply felt Larghetto. Rampal’s colleague Munclinger accompanies him in the concertos by F.X Richter and Benda – these complement the two composers’ (who were exact contemporaries) chamber music beautifully – and it’s notable how much elegance Munclinger draws from the Prague Chamber Orchestra. Munclinger’s cadenza in the Benda is pretty dazzling the way Rampal dispatches it. Martin Turnovský directs the Rössler-Rosetti Concerto where Rampal’s cadenza seems to half quote from Mozart’s violin concertos. The horns are on especially fine form in this concerto and the Rondo finale is vivacious. Finally, Supraphon recorded the Carl Stamitz Concerto in G major with its abundance of string lyricism in the central slow movement. Here the conductor is Václav Neumann in October 1955, the year before his highly auspicious appearance at the Komische Oper in Berlin. The production values, photographic reproductions, booklet notes and, above all, transfers are excellent. This twofer catches Rampal at a time of new exploration with a new audience and collaborators, expanded repertoire and a record contract, however brief, with Supraphon. Given that the Richter Concerto and Sonata are making their first CD appearance, Rampal’s admirers should on no account overlook that fact and the other many excellences on offer here.